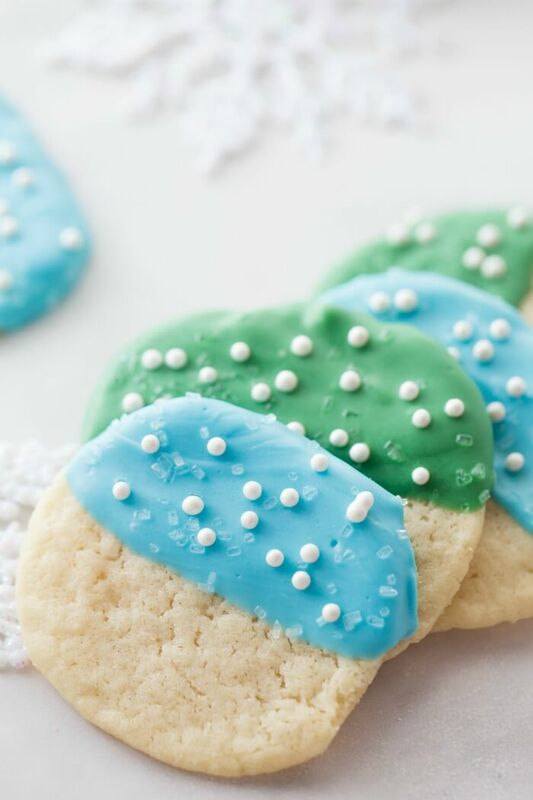 Our Easy Holiday Cookies are the perfect cookie treat to make for your Christmas cookie exchange! 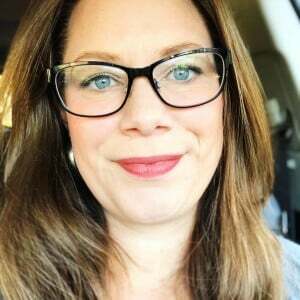 Get the kids in the kitchen with you too! 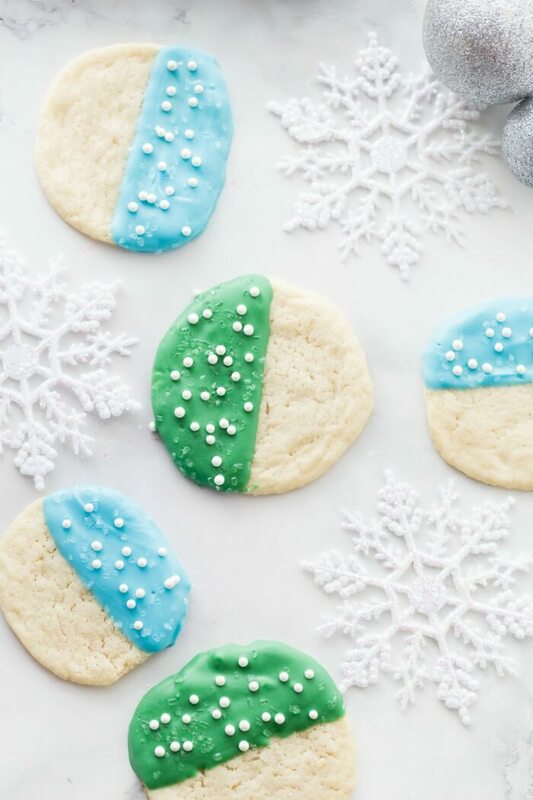 Easy Holiday Cookies are the best! Tis the season for COOKIES!!! 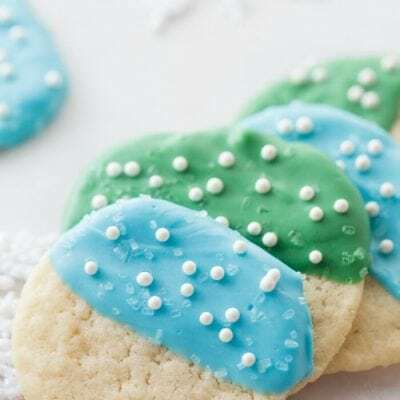 I don’t know about you, but I just love delivering batches of cookies to my neighbors, especially this Holiday Sugar Cookie Recipe! 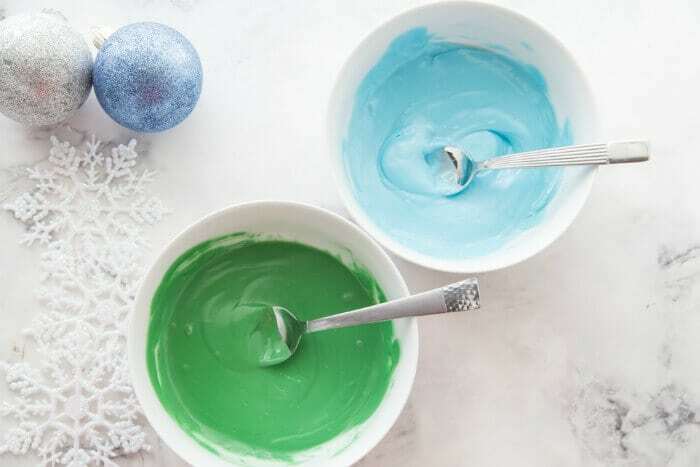 Easy to make, delicious and pretty holiday colors. What more could you want? Make them along with our Peanut Butter Cookies, Nutella Cookies, and Cinnamon Roll Cookies for maximum holiday cheer! Sugar cookie dough – We used a pre made sugar cookie dough from the refrigerated section of the market, but if you have a sugar cookie recipe you love then by all means use it! Candy melts – Candy melts are usually near the cake decorating section, or if you’re at Walmart near the wedding section. You can also find these at craft stores like Michael’s. Sprinkles – Choose your favorite wintery combo! First, slice frozen dough into disks (or form into balls if you did not freeze) and bake. Next, allow cookies to cool completely. Then, melt candy melts in the microwave or with a double boiler. Be careful not to overcook as candy melts will scorch. Finally, dip cookies halfway in melted candy melt, and place on a silicone mat or parchment paper. Decorate immediately with sprinkle while the candy melt is still liquid. 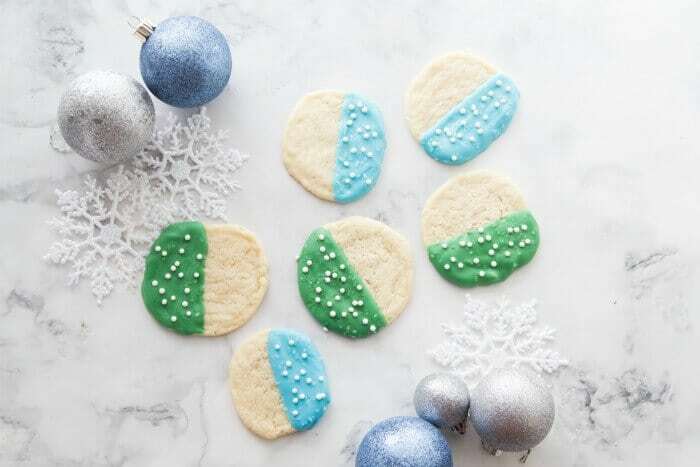 My favorite colors for these easy holiday cookies are blue and green because they cover both of the major holidays – and also they look super wintery, but you could choose any color combination! 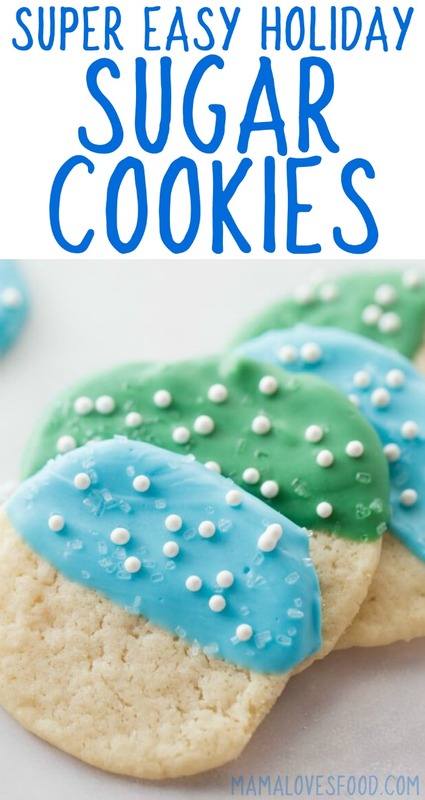 These are also great cookies to make for any colorized occasion – try pink and purple for a girl baby shower, blue and green for a boy, yellow and green for a gender neutral, or maybe orange and blue for your favorite sports team. Go ahead, tease me for not having my own sugar cookie recipe. But P.S. I really love the Pillsbury™ sugar cookie tube! It’s yummy, and simple, and fun to experiment with! We pick up ours at Walmart. I also love candy melts. Also grabbed at the big W. They’re so fun! 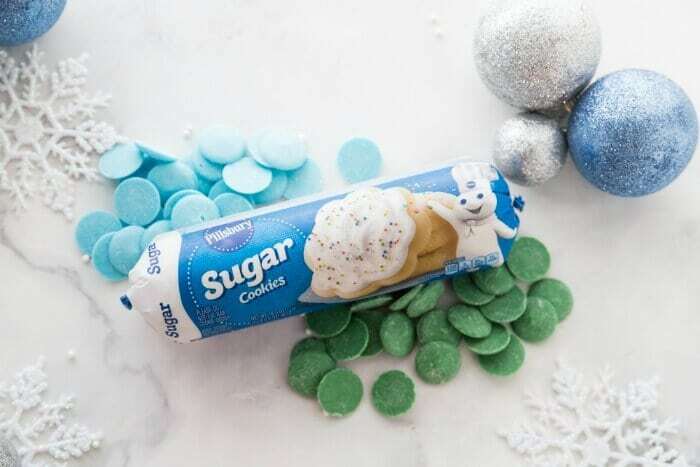 Sugar cookies + candy melts = winter wonderland cookie extravaganza! We also like to use pre-made dough in our Chocolate Chip Cookie Cups, our Chocolate Chip Cookie Pie, and our Cookie Cake. 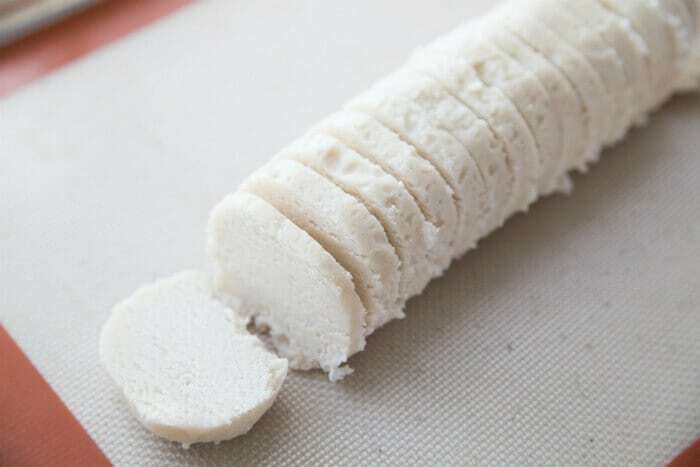 ★ Pro-tip: if you freeze your sugar cookie chub (did you know that’s what the tube of dough is called?! ), it’s easier to slice perfect circles. It also keeps the cookies from spreading too much! ★ We use the microwave to melt our candy melts, but you can also use a double boiler. Either one will work just fine if you pay close attention. ★ It’s important not to overheat the candy melts because they will scorch. And scorched sugar is not so tasty! ★ Obviously use whatever sprinkles you love (let’s be real, I love alllll the sprinkles! ), but can I suggest the white sugar sprinkles in combination with the pearlized round sprinkles? They just look so wintery and snowy. ★ It would also be cute to do the green dipped cookies with red sprinkles and some red dipped cookies with green sprinkles! 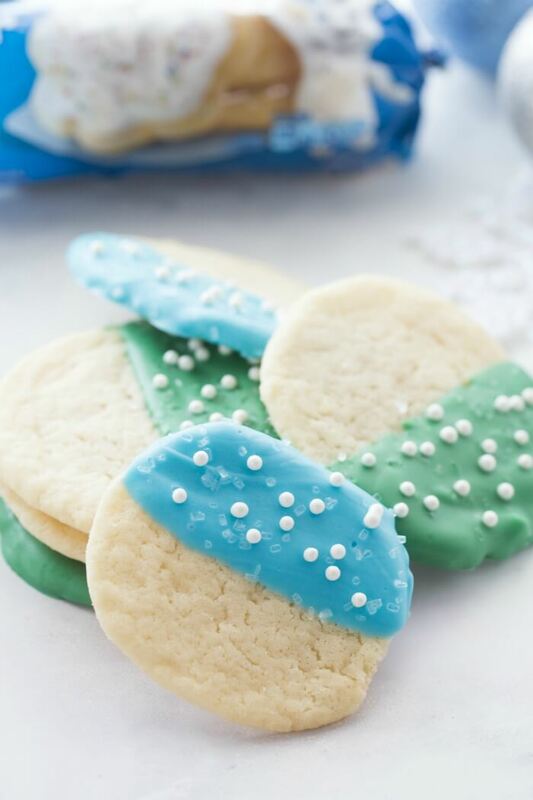 Easy Holiday Cookies are a total holiday treat, so we tend to serve them with holiday fixings! 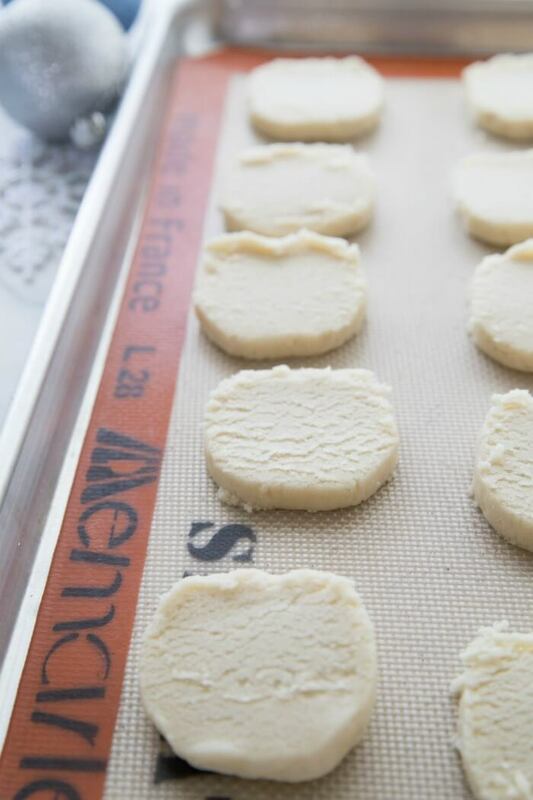 Slice frozen dough into disks and bake on a silicone mat or parchment paper, according to sugar cookie recipe directions. Melt candy melts in the microwave (use 10 - 15 second increments, stirring in between), or with a double boiler. Be careful not to overcook as candy melts will scorch. 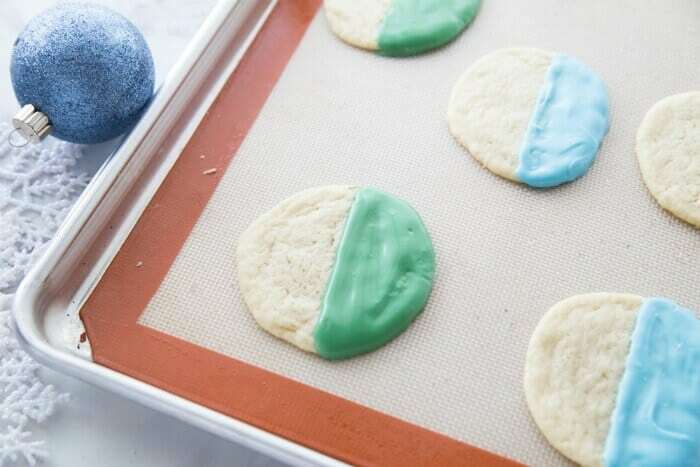 Dip cookies halfway in melted candy melt, and place on a silicone mat or parchment paper. Decorate immediately with sprinkle while the candy melt is still liquid. Do not wait until you're done dipping or the candy melt will have hardened and the sprinkles won't stick. I would like the whole batch please! lol. What a great idea. I love semi homemade treats!